At the tail end of summer, just before school started, the four of us (plus our new dog!) 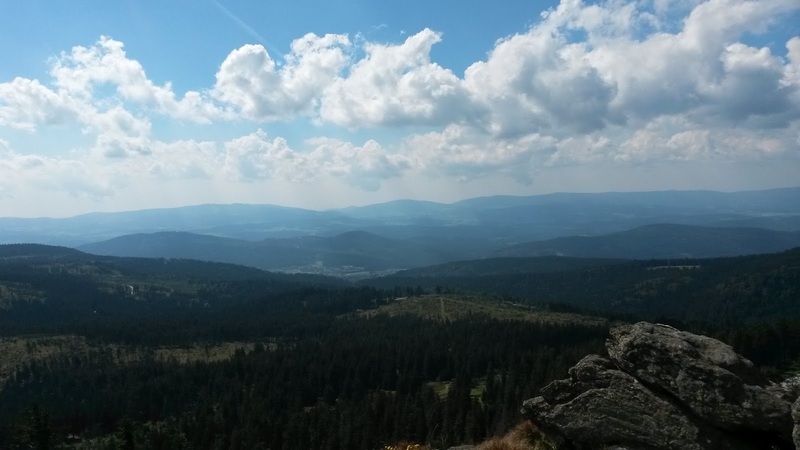 squeezed in a week-long trip to the Bavarian Forest. Our first stop was the Waldwipfelweg (Tree Top Sidewalk). It's a wide, gently sloping wooden pathway that takes you up 30 meters (98 ft), to the top of the trees. I was also very brave and walked over an extra section of hanging bridge, which wobbles as you tread on it. 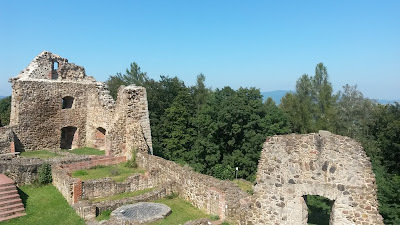 While searching for things to do, I found that there are twenty-five castles or castle ruins within 50 km (30 mi) of our hotel. So, obviously, we had to check some out. These are ruins of a 12th century fortess in Runding. A couple of days later, the morning news was full of reports of a group of people who got stuck in gondolas on their way up to the Mont Blanc. Yikes! 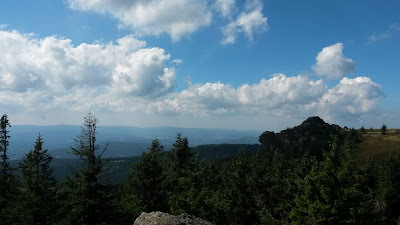 So of course, that's the day we decided to go up on a mountain ourselves: the Grosser Arber. Granted, this mountain was not as high, but we did have to get into gondolas and pretend we hadn't just seen the stunned vacationers stumble out of their 12,000-foot-high, nighttime prisons. The Grosser Arber is technically part of the Bohemian Forest, but some claim it for the Bavarian Forest. The dog did surprisingly well at climbing the last bit to the summit. We think he's part mountain goat. I think that's the Czech Republic in the distance. Next, we made it safely down the mountain and had a wonderful walk around the Grosser Arbersee. What looks like dry grass is a floating island (aka Schwingrasen). See below for more details. When you walk around the lake, you're repeatedly warned about the dangerous trees. Trees may strike without warning. 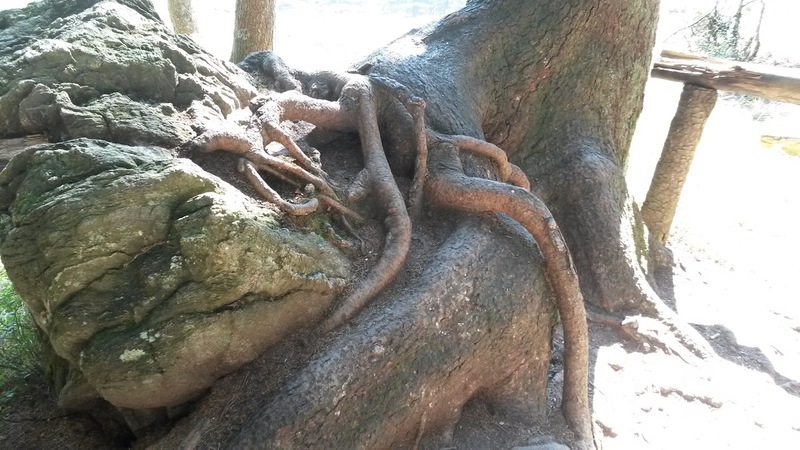 If that sign didn't convince you, here is proof: a boulder-eating tree. 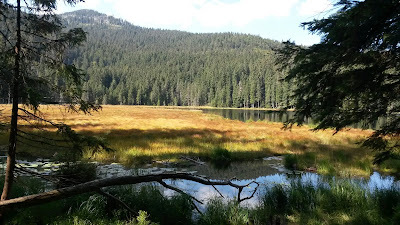 But the most fascinating thing about the two glacial lakes, Grosser Arbersee and it's sister, Kleiner Arbersee, has to be the natural floating islands. Plants called Schwingrasen have grown off the shoreline onto the lake. 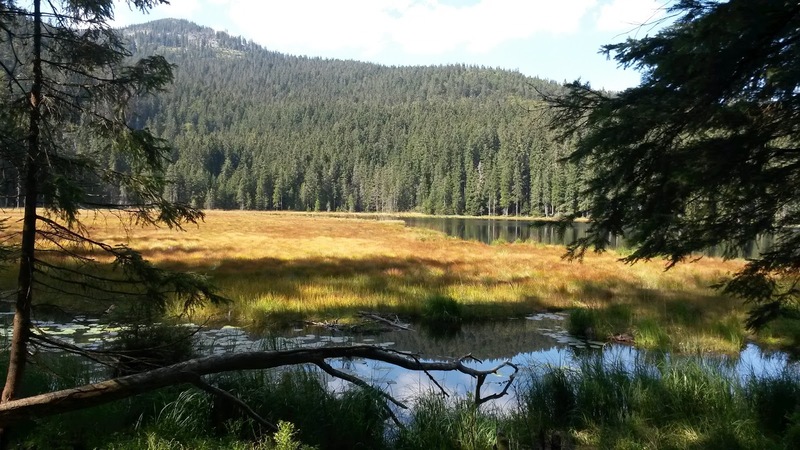 In the case of the Kleiner Arbersee, these mats of Schwingrasen have even detached, forming floating islands between 3 and 9 feet deep and sturdy enough that spruce trees grow on them. When there's a storm, the islands are literally blown around the lake. During our trip, there was one missed opportunity. Our apartment was in Bad Kötzting, which is only a few miles to the Czech border, so I thought we'd take a day trip there. Nope. 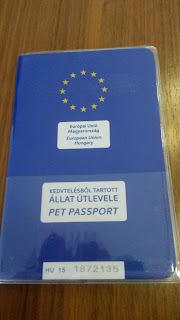 Turns out you can't cross the border without having everyone's passport. The four humans had theirs, but we'd left the dog's at home. True story. You thought I was kidding, right? 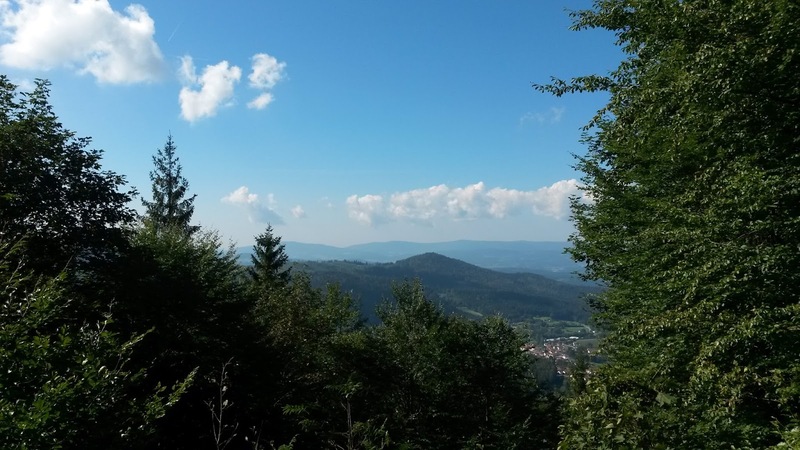 If you're in Germany and looking for a nice place to spend with family, I'd highly recommend the Bavarian Forest. Our apartment even had free daily entry into a nearby spa/water park, good for kids and adults! Bonus shot! My 9-year-old's dream: a life size toy, still in the box. All pictures by me or my family members. I Blogged about Twitter for SCBWI! A colleague at the Society of Children's Book Writers and Illustrators (SCBWI) was asking about Twitter - what it is and how it works. 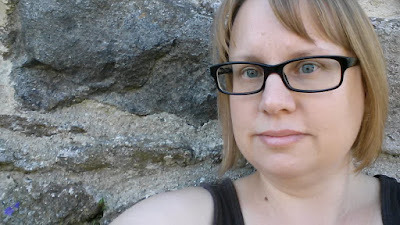 So I blogged about it. The recommendations of who to follow are geared specifically toward writers, but the rest is generic, so feel free to stop by if you're interested in finding out more. Click here for Social Media in 140 Characters (Twitter, Tweetdeck & Co).